On one hand, there is the great tradition of jazz, its compact academic virtuosity, the unmitigated, high demand, which sets this style apart and uplifts its listeners. On the other hand, there is the urgent desire of many young musicians to get the upper hand, find their place with their art in the present, absorb contemporary influences and fire the enthusiasm of a new generation for this supposedly outmoded genre. The trombonist Max von Einem succeeds in this balancing act between the past and the future as hardly any other musician in Germany today. "I can't stand all of this narrow-minded thinking," the 28 year old clearly stated his dislike of any type of purism. For the fair-haired musician born in Münster and currently living in Cologne, however, this means not only the dogmas of the notorious jazz police, but also such people who want to be hip at any price and put the classical values of jazz permanently in a trashy corner or smile condescendingly at it as old-fashioned. "Jazz has never been old-fashioned," von Einem stated in a passionate statement in favor of "his music". "Many great concepts are based on swing and wind instrument sections, and DJs sample the songs of great jazz legends. Jazz has something that can prove to be fruitful for every other style." Max von Einem should know it. In his "main job", he has played the trombone in Heavytones, the combo similar to a big band on Stefan Raab's long-time, popular television show TV Total during the week since January 2013. In the rest of his time, he has been involved in his refreshingly undogmatic quartet Einem.Art since 2011: very successfully in both cases. The fair-haired guy, who studied trombone under Bart van Lier at Folkwang College as well as under Henning Berg at Cologne Music College and has played in the WDR Big Band, Frida Gold, Sunday Night Orchestra, Blassportgruppe Südwest and Mardi Gras.BB, already won the Sparda Jazz Award with Einem.Art against top-rate competitors. Since that time, the lively combo with pianist and composer Lucas Leidinger as well as the two Columbian childhood friends Juan Camilo Villa (bass) and Rodrigo Villalon (drums) have provided a refreshingly different color in the German jazz club scene with their debut album "Lamara" in the renowned "Jazz thing Next Generation" series. An elegantly flowing trombone floats optionally above the swinging-sparkling piano, which alternates with hard keyboard passages and is drawn by the driving bass and the grooving drumming into a strong undertow of polished loops and electronic effects. It is not a question of cheap, populist tricks, but instead of clever and passionate sound constructs that touch upon the infinite cosmos of improvisation as well as the colorful world of sound of funk, rock or the surroundings. 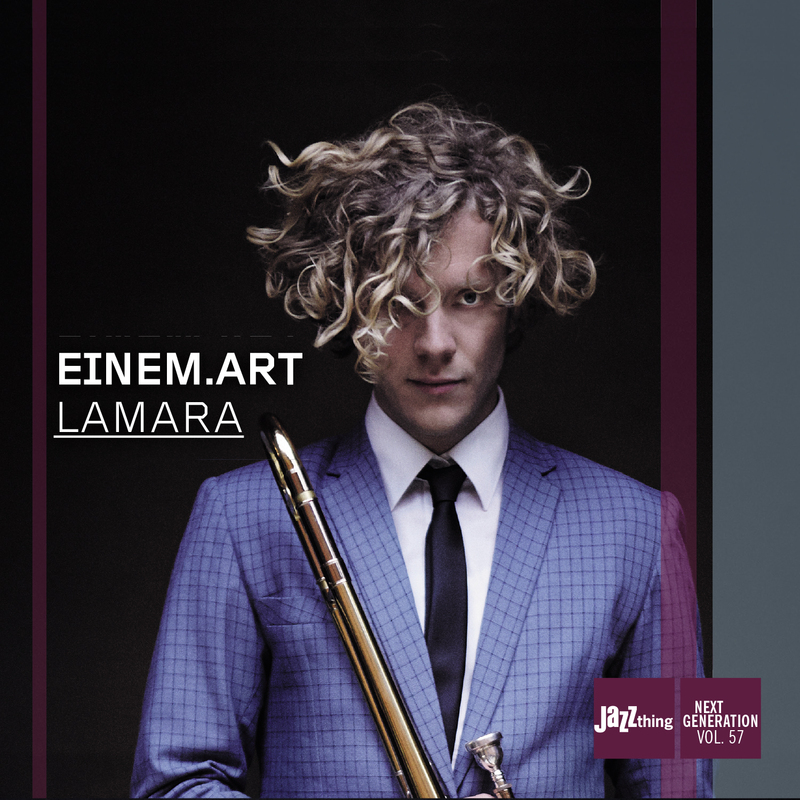 "There is so much interesting music floating around," Max von Einem said, who remembered a former roommate in naming the CD title, who once fondly gave him the humorous nickname "Lamara-Max". As godfather of such an approach, the trombonist is in best company with two prominent German musicians. Albert Mangelsdorff during his life and now Nils Wogram care little for boundaries, but instead always considered themselves adventurers who continually expanded their own musical horizon. Of course, the respective orientations are completely different. However, Einem.Art goes its own way consistently and provides stories to listen to and material to dance to at the same time. This is how current music should sound, which goes beyond the label "jazz" in 2015. Just the next generation. ""The trombonist Max von Einem handles the managing act of present and future like no one else at the moment. A brilliant trombone talent."" ""Lamara captivates with some very successfull compositions...""
"A nice amuse-geule as an opening, smooth in the beginning, followed by several hints of the enjoyments to come, some of them exploding all of the sudden, some of them unfolding gradually. "